Welcome to another day of MCT Sneak Peeks! Onto Day 3, we are showcasing the Freebie, (first 150 shoppers). You Inspire Me stamps and die! This set is made up of the three word stamps and the label die. I made this quick and simple gift card using the Embossed Gift Card Holder. Added some sequins and ribbon with pretty So Lovely Carta Bella Paper and I have a gift card holder for someone special. Awesome beautiful gift holder. I've been keeping my eye on this dye for some time...hopefully will be back in stock soon. Thank you for the inspiration. Love your little gift card holder! Super cute! Wow Miss Brigit You sure created one Gorgeous Gift card holder!! OH that paper is Devine!! Definitely one awesome presentation!! Great creative job!! YOU DO ROCK!! Beautiful, Brigit! A lovely use of those printed papers. The whole thing comes together beautifully! So darling! I love that paper! Your gift card holder is fabulous! I love the pretty paper and fabulous design! Pretty paper and I like the inked edges. The new label and stamp look beautiful...I love the fonts. I like the pink shiny bow and sequins. Wonderful job. OMGosh this is sooooo pretty. I loVe it. Thanks for sharing. I lovethe old time look so beautiful!!! So pretty -- the colors, design, and idea. Love your card and how you antiqued the edges! Great new die and stamp! Seeing your creation has inspired me!!! Have a great day! Pretty card! Love your color combo! 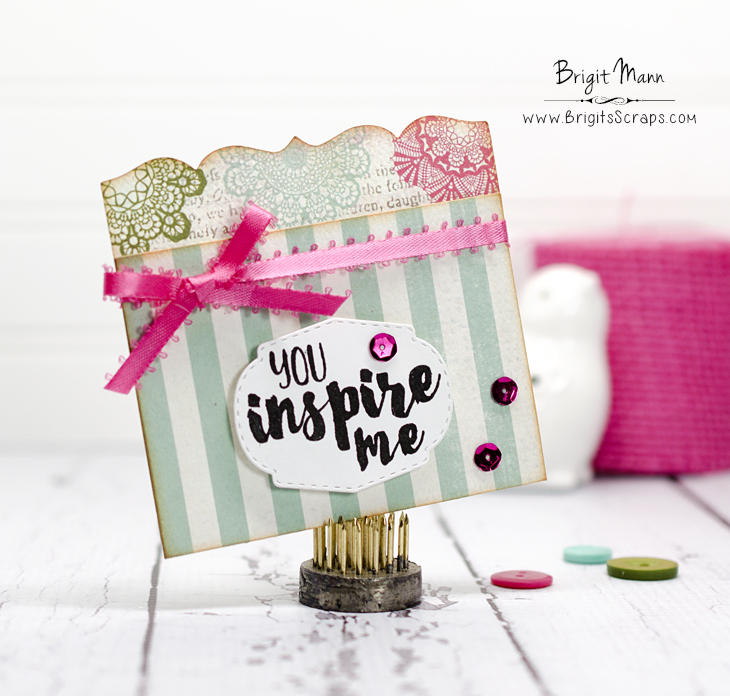 Fabulous Inspire stamp and die set! I love your gift card holder. The different designs and colors look great.